This Deviled Egg Salad is perfect for a light lunch, to serve at brunch and to help you use up all those colorful hard boiled Easter eggs. This salad is perfect for a light lunch, to serve at brunch and to help you use up all those colorful hard boiled Easter eggs. You know when you get married and you start incorporating recipes and traditions into your new family and you realize the things that you thought everyone else just normally did, are completely brand new to your significant other? Well, that’s what happened with this Deviled Egg Salad. 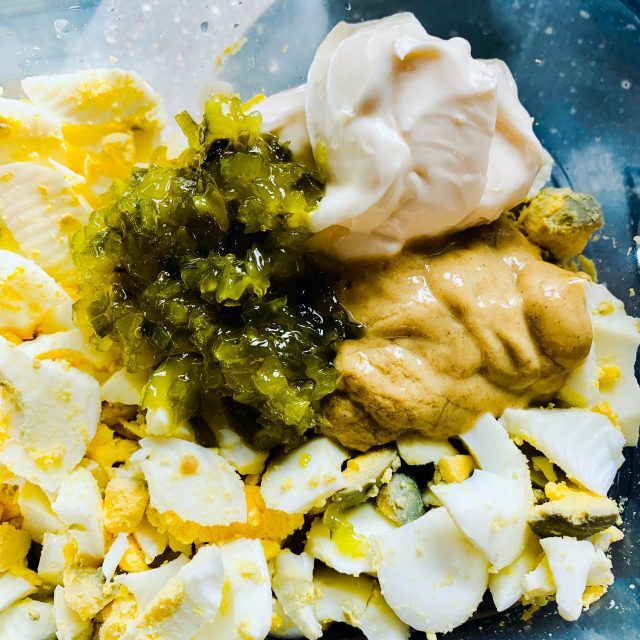 My Mother has always made this Deviled Egg Salad recipe, and well, I just thought the rest of the world did also! 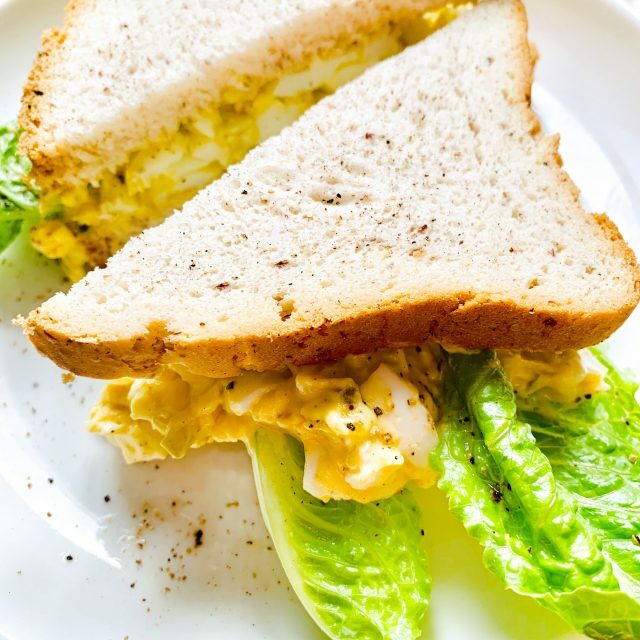 When I make this salad my husbands face lights up and he says ‘Oooh you made your egg salad!’ And tells my kid ‘Mom makes the best egg salad.’ The words that any cook loves to hear. Such a simple recipe, but my Mother got it just right all those years ago. Who knew Deviled Egg Salad would be such a treat for my own family. Add a leaf of lettuce, a couple of pieces of bacon on top if you wish. We always have rye bread on hand for this salad, but served with crackers or a scoop on top a garden salad are simple options as well. Place eggs in large pot, cover with water and add vinegar. Bring to a rolling boil. Once boiling, remove from heat and let eggs sit in boiled water for 10-12 minutes. Place pot in sink and carefully run cool water into pot to gradually cool down water and eggs. 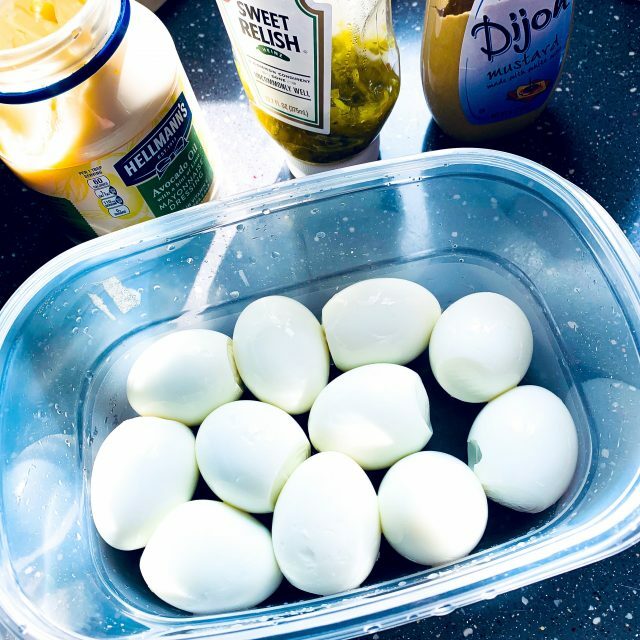 Once cool, carefully remove eggs from pot and place them in a container in the fridge for at least 1 hour to cool or until you are ready to peel them. Peel shells from eggs and place eggs in medium sized bowl. Gently break eggs whites and yolks with knife, leaving large pieces. Add mayonnaise, dijon mustard and relish. Mix ingredients together with a fork while gently mashing the eggs. Leave eggs a little chunky. Adjust mayonnaise to desired consistency. Add salt and pepper to taste just before serving. 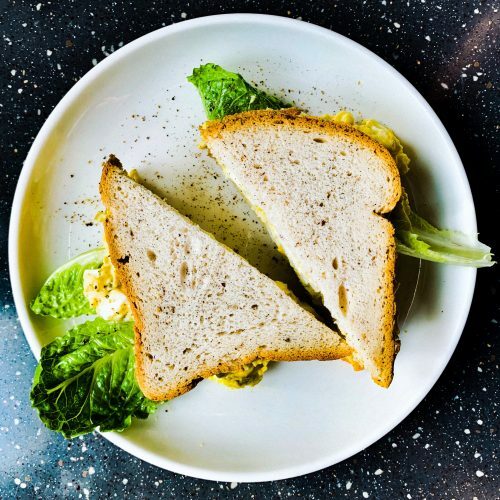 I recommend not mixing salt throughout the salad for storage purposes, because salt will pull moisture from the mixture and make the egg salad watery. Instead, add salt and pepper to taste just before serving. If serving in help-yourself-bowl, sprinkle a little paprika on top for presentation.